The equipment required varies based upon how long a person has been with the club. The following chart lists the gear to acquire at each level. Most fencing equipment vendors offer starter kits that include several items, such as mask, jacket, glove, and weapon. They also sell electric fencing starter kits. Knickers are the knee-length fencing pants that must be paired with knee-length socks in order to cover the entire leg, and replace the sweat pants. The plastron (also called an underarm protector) is a half-shirt worn underneath the jacket that protects the weapon-side underarm. The t-shirt is just something comfortable to wear beneath the plastron and jacket (some fencers wear Under Armour, a special sweat-management fabric, instead of a t-shirt). Electric equipment gives fencers immediate feedback about whether they are hitting correctly (or at all) and is also required for official USA Fencing tournaments. A chest protector is required for all female fencers, regardless of age or experience level, and is NOT a substitute for the plastron. Club members must have the gear listed in the table above down to and including the row matching their experience level (e.g. at 6+ months of membership the fencer must have all the items shown in the first three rows). Electric equipment is optional at the club for the first six months of membership, but required after that (and at any official USA Fencing tournaments). After buying equipment be sure to write your name or initials on it! Any unmarked equipment left behind will become the property of the club. The following list is other fencing equipment that is not necessary but is often a good idea. For foil and epee weapons there are many choices available for the grip (the part that you hold in your hand). 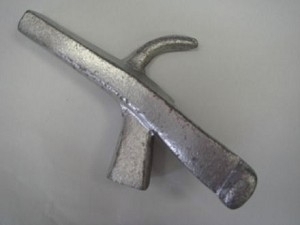 There are two general types, French and Pistol, but there are many variations of the pistol grip with different shapes and sizes. 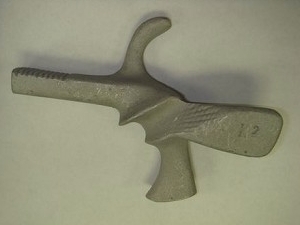 All variations of the pistol grip can be bare metal or have an insulated coating. Also, the same style of grip can differ slightly between manufacturers, so it is important to identify both the style and manufacturer that is the most comfortable. The available (and legal) styles are shown below. The "classic" grip, it is noticeably simpler in design than the pistol grip. This simplicity allows it to fit almost any size hand, but it also makes it less comfortable to hold. 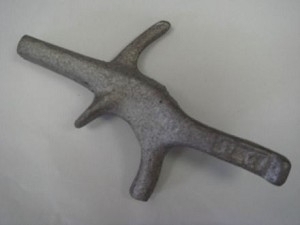 This grip has a coating made of rubber or leather. TFC's practice weapons used by students in the beginner classes all have this grip. 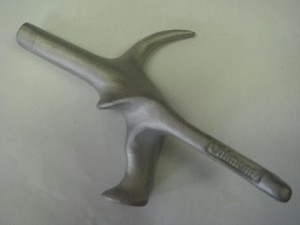 A bulkier design with a third finger stem instead of grooves, most vendors only offer one size that is only useful for fencers with medium-sized hands. Other sizes exist but are not widely available. Similar to the Visconti but slightly longer and narrower. 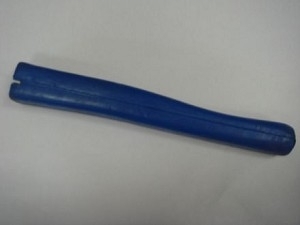 There is also a "short" version that has a much shorter wrist stem, but this variant is not widely available and the size of the rest of the grip is the same, making this style only suitable for medium or large hands. A very rectangular & bulky style with minimal finger stems and no finger grooves. With only one size available this design is more suited for large hands. A compact style with a short, flat wrist paddle that allows for a greater range of blade movement. This design only comes in one size and is not widely available, and is more suitable for small or medium hands. 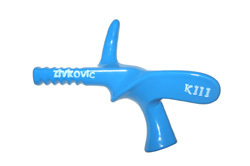 Zivkovic is actually an entire line of grips, currently offering 11 different designs. The one common element in all of the designs is a short, flat wrist paddle similar to the Hungarian grip. 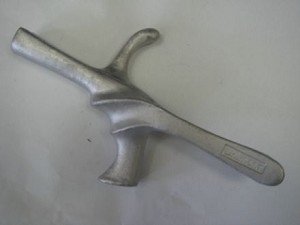 The different designs' shapes and sizes vary, making this type of grip suitable for a wide range of fencers.